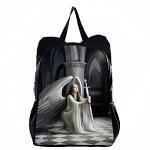 Enjoy inspiring fantasy-themed imagery on backpacks, bags, totes and more. Breathtaking scenes of fairies, dragons, gargoyles, Celtic themes, Egyptian themes, princesses & unicorns, Gothic themes and more. The soft silvery hues depict an angelic woman, kneeling as she curls her fist around a sword and pushes it outward. Her white robes dip down and brush the ground gently as a stream of sunlight filters through the runes offering a softer scene, and her neat white wings unfurl from her spilling robes. If you are a lover of magickal beings, this angel backpack is the right pick for you as it bears a duet of the purity of an angel and justice met at the end of a blade, this ‘dual-natured’ backpack truly shows the serious side of angels. This angel backpack holds many secrets in itself just as you can when holding all your essentials. The dark creature advances, her gait is smooth with each turn of her hip. Her sauntering forward grabs the attention of the view and captures their eyes, her large webbed red wings stretch outward and from her neck sways the bulk of a choker; a black widow dead center. Webs hang down and droop gently, spun carefully and with attention as the webspinner hangs from the stone wall, bearing a red cross on her abdomen. If youre a fan of darker magick then this gotchic fairy and spider bag is just for you! The vampire kneels down, her skin nudging the cold stone beneath her as she flashes her fangs as her lips pull into a weak smirk. Bats swoop above head in a scattered frenzy; clustering evenly above her. The scene around this vampire is gloomy, dark, and adorned with skeletons and symbols of skulls. 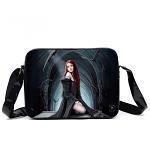 If you are a fan of dark and the gothic then this vampire sidebag is fit for you. Against the harmony of pale pinks and oranges stands a thick black hide, shimmering against the warm caress of the sky stands proud on hid haunches flashes us our traditional horse pose. As this black unicorn rears up, it shows us even the darkest of beings can live in unison with those of our lighter and softer. A unicorn is a symbol of purity, though, this unicorn bears a black hide; showing us justice and purity can still lie within no matter what color. 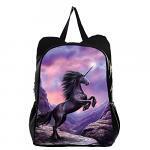 If you are a fan of this magnificent creature then this Unicorn Backpack is ideal for you! 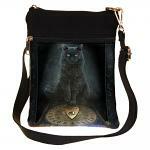 Honor your love of Ouija with this artistic bag featuring a black cat and a Ouija board. Named "His Master's Voice" by the artist this purse is a creative expression of the love of the spirit world. The long charcoal body of a traditional Chinese dragon tangles around a young woman who offers a jovial grin to those viewing. The carded red fan she bears in her hand features a similar dragon waving along its folds and crevices as she waves it off. 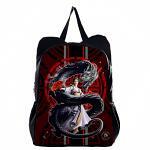 If you are a lover of creatures and mythical beings, this splendor bag is the right fit for you! 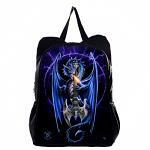 This dragon backpack holds many secrets in itself just as you can when holding all your essentials! Slender fingers gently card through the red locks that spill over thin bone fingers as the lass falls gently in death’s embrace, who stands tall, shrouded with a black cape hung over his frame loosely as his large dove wings unfurl from his cloak and encircle the woman. The young woman lays rest in death’s cold hands as she flirtatiously pivots her hips toward him in an enchanting manner. If you are a fan of the mysterious, the unexpected, and the daring then this Death backpack is fit for you! This lavender bag features a sleet dragon perched upon a mulberry rose, mouth parted as it gives off the impression of a formidable roar. This bag carries a mature and strong impression as it is not too busy with its art and though the idea is simply, it truly captivates your attention! Imagine what those around you think! 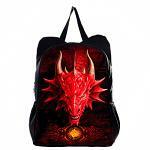 If you have the passion and fervor for mythical beings, such as those as elegant and defiant as a dragon; this royal dragon backpack is a great match for you! This dragon backpack holds many secrets in itself just as you can when holding all your essentials. The duet of two dragons tangle around a gothic cross bearing 5 black jewels. The two twin bodies link and join in unison, reforming peace, and bringing a sense of romance and friendship forth. 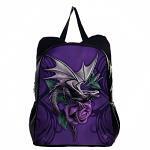 This dragon backpack is great for those who enjoy social status and enjoy the company of others! This backpack also takes to the darker side of magick as it bears a gothic cross in the center where the two dragons meet. 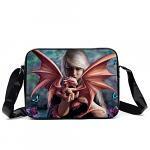 The power of dragons is captured in striking detail on this handy-sized messenger bag. The dragons clutch the Celtic stone as multi-dimensional artwork brings these creatures to life. Great for tablets, small laptops, paperwork and carrying your daily essentials. Do you have a gentle heart for the softer and lighter side of magic? Do you enjoy seeing the new beginnings of life, how they start, and where it all begins? This black dragon egg backpack shows an enchantress cupping a golden egg where a young dragon hatchling is encased, and shows the start of a magical journey! The soft and cozy gold illuminates her face bringing warmth to the scene just as it will with you! This magical dragon backpack leaks light into the hearts of many and makes it the perfect gift or bag for any with a soft side and it holds many secrets in itself just as you can when holding all your essentials. The dragon curled its serpentine frame around the tree as it gazed upon the young elf who placed a gentle a friendly hand upon its tail, a gesture of familiarity. Her eyes offer warmth to the smaller creature as it returns a similar look to the forest-dweller. If you love a lighter side to magick then this bag was made for you. 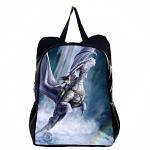 This Dragon and Elf backpack holds many secrets in itself just as you can when holding all your essentials. A saturated blue dragon hangs from the steel guitar, body wrapped and tangled along its curves and sharp ends. As it splits its jaw and exhales a puff of fire, lightning bolts wrap in a circle behind the large and menacing frame, offering a fearful scene. The dragon covets this new found treasure and keeps himself protecting its value. 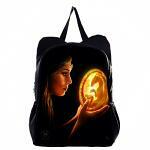 If you are a lover of powerful words and the darker side of magick then this dragon and rock backpack is for you! Lancing upward, a pale blue frame adorned with glittering scales slices through the swell of white clouds, and a serene dignified dragon bearing a young enchantress on emerge from the undulated puffs. These two take to the skies on the search for something new and a start to a new adventure. Do you too yearn for the start of something new, an incredible journey out of your regular droll days? Well, this dragon backpack is perfect for those who just want to spread their wings and seek the wonders of the world without a single thought of another unrelieved day throughout their lives. This dragon backpack holds many secrets in itself just as you can when holding all your essentials. This foreshortening view offers a young woman who extends her arm, cupping a small red dragon between her fingers. Butterflies flitter around her as she offers the viewers a glimpse at this wondrous creature who shows little harm and even offers a warm smile. 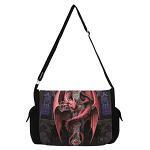 This Gothic Dragon messenger bag is a great way to carry all your daily essentials or keep your tablet or laptop safe during travel. It's vibrant and Gothic design reveals a detailed red dragon curled around a bejeweled Gothic cross. The plum-colored stained glass windows in the background provide the perfect atmosphere for this Medieval design. 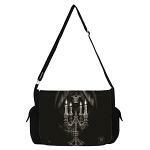 Keep the captivating emblem of Witchcraft near you at all times with this handy-sized messenger bag. Great for tablets, small laptops, paperwork and carrying your daily essentials. 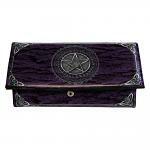 The allure and mystery of witchcraft comes to life in this smart wallet you can use to bewitch those in your company. The wallet features a rich design with varying shades of purple and an embossed look of silver and jewels. There is a zippered pouch inside for your change, compartments for money or receipts, and slots for your cards and license. The greyscale backpack features a smooth woman clasping a rosary against her palms as her lips part into a prayer. Two uneven streams of tears leak down from her eyes and lace down her cheeks. She utters a simple prayer, offering all she can for it to be of success. 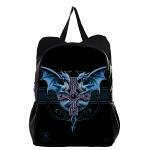 This Gotchic backpack is wonderful for any who is a fan of Gothic culture.